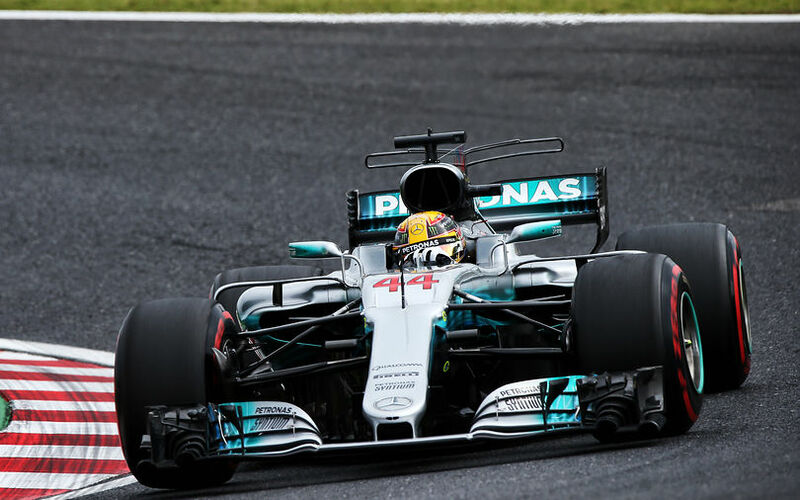 Lewis Hamilton enjoyed an impressive run in qualifying as he topped every session on his way to pole position for the Japanese Grand Prix. He is set to start alongside Sebastian Vettel as Valtteri Bottas, who qualifying second, will be demoted to 6th. Ricciardo and Verstappen will start from the second row on the grid. Qualifying kicked off with Ericsson out first, but Mercedes were soon out to follow suit. Of those, Bottas was the first to start his flying lap, but on that attempt he immediately lost control at Degner 2, only just managing to keep his car out of the barriers. His next lap was better and enough to get through into Q2, but the Finn's use of supersoft versus soft for Hamilton says enough on the mindset of Bottas at Suzuka. Hamilton was unfazed and completed a string of laps to reach the optimum working temperature for his soft tyres, eventually ending up fastest in Q1. Raikkonen slotted into second after similarly opting to use supersoft tyres, contrary to Vettel who also completed Q1 on softs. Proceedings were fairly straightforward after Bottas's off, with nobody else in for rally until Grosjean ended up trashing his Haas car through the S Curves. The Frenchman initially reported he believed something was wrong, but his body language - showing extreme disappointment - when back at the pits appeared to show the Frenchman understood he may have been at fault himself. The damage was such that the session was red flagged 1:18 from the end, effectively ending the session and slightly delaying Q2. The start of Q2 saw Raikkonen and Bottas go out on softs as they both aimed at starting the Grand Prix on this tyre in an attempt to recover from their 5-place grid penalties. By that time, Hamilton was already well underway as he went out first. His first and only lap in Q2 was immediately good for a new track record, rounding Suzuka in 1:27.819, leaving Vettel 0.663s down. Bottas actually ended up just a single tenth down on Vettel, an impressive feat on the soft tyres, and also half a second faster than Raikkonen on the same type of tyres. Apart from the two soft runners, everybody used supersofts, with two of them opting for a set of used tyres on their first runs. Both Alonso and Sainz chose to do so, hence saving a set of tyres as their respective 35-place and 20-place grid drops would mean a start from the back anyway. Jolyon Palmer from Renault similarly totalled a 20-place grid drop. Alonso did however return for another run on new supersofts, moving up to 10th and demoting Vandoorne to 11th. It's an interesting change for Vandoorne though, as that enables him free choice of tyres for the race, while starting from 10th anyway. Q3 kicked off with Bottas heading out to the track, followed by Hamilton, Raikkonen and Vettel. 5 other cars followed soon. Alonso remained in the pits while Raikkonen immediately returned after another near-miss at Degner 2. For Hamilton, things ran smoothly as he further improved the track record, edging out Vettel by 0.452s and Bottas by 6 tenths. Ricciardo, Verstappen, Ocon, Perez and Massa were all more than a full second down. On the second runs, Hamilton was unable to improve, but it was enough to hold on to pole. Valtteri Bottas moved up to second, followed by Vettel, the two Red bulls and Raikkonen.